In case you haven't been keeping up with the reports over on Desperately Avoiding Housework, here's a quick summary: The Baby is bad. Today I went to the restroom for a minute and heard him around the corner saying "Uh-Oh". Oh no. I can't even pee for 30 seconds without him getting into something!! 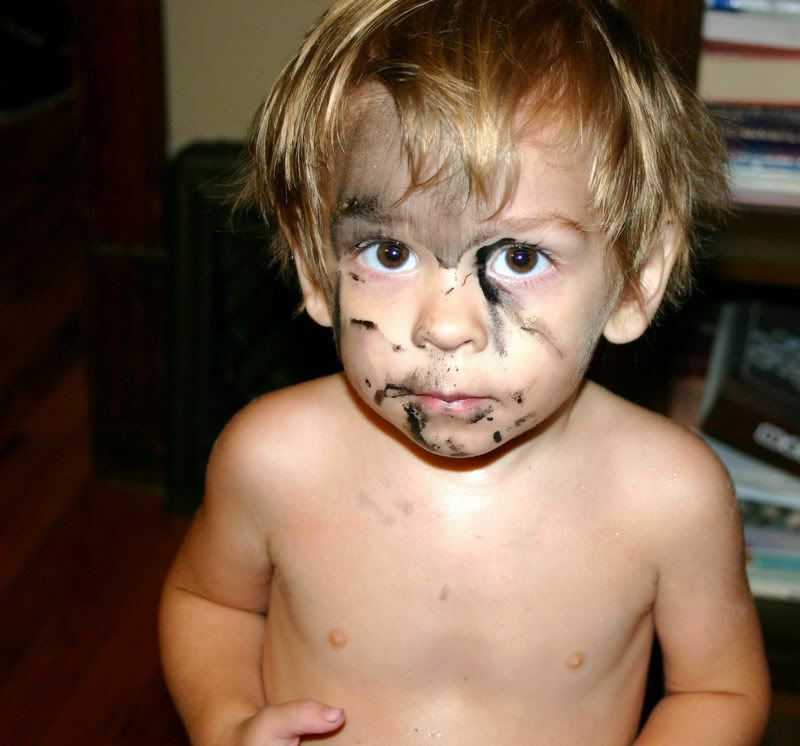 He'd found black acrylic paint and dumped the bottle. I didn't even know I owned black acrylic paint, but apparently so! Well, I don't anymore because, you know, he coated himself and the kitchen in it. All over the countertops, my baking stone, the floor, the dining room chair that he pushes around the house to use as a ladder... Oy. I put him in his high chair (which he can also easily climb out of) so I could clean up the kitchen. Then we went out to get a few groceries. He was screaming and having a fit so I got a bottle of water to entertain him while I tossed random things into my cart and ran through the store. And sure enough, he got angry about something and dumped the bottle of water over the top of all the groceries. I'm never taking this child in public again until he's 5. Ever. Seriously. He brings me to tears every time I try it. He's bad. Fortunately he's taking a nap at the moment, which is practically unheard of for him so I have a few moments of peace. oh honey, I am with you 100%. 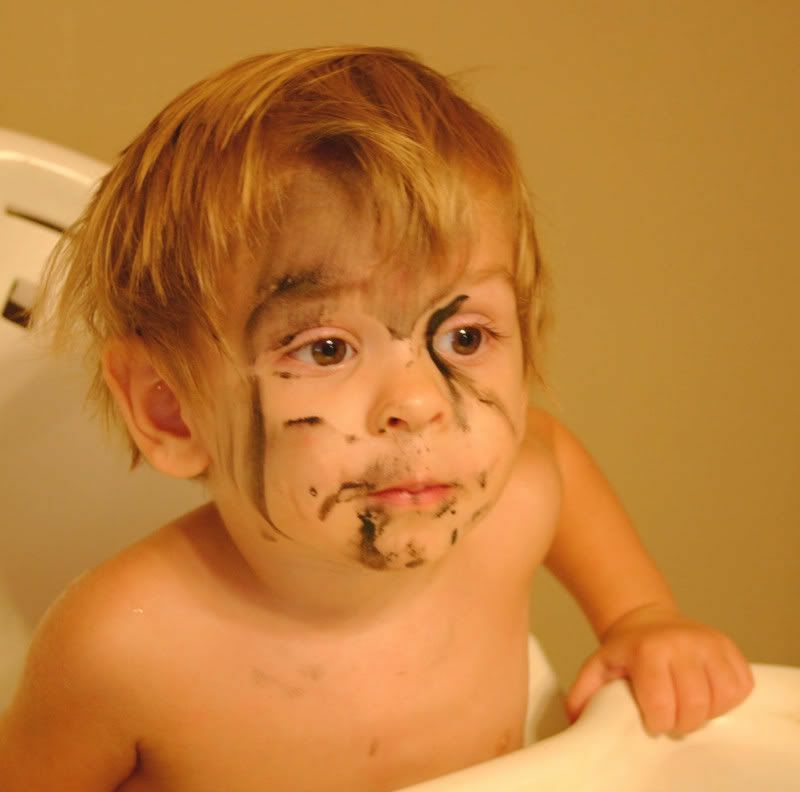 My kid's usually choose permanent markers and draw on my walls... but I SO know the feeling. And I love the necklace (and all it stands for!). Oh my,he is full of energy..What a darling..I know, I can say that, since I am here and you are there..
Tell me, is that a Fingerprint or what? I did my Fingerprint..hope you are still doing it..it is a beautiful thing and makes us aware..have to go shopping, but wanted you to know that I did it..
Awwwwww, sorry you had such a hard day! I had THREE little boys and remember many many messes ... such as when the first two were very little and my mother (WHAT was she thinking?) bought them WHITE shorts. I got them all dressed up for a birthday party, sent them out to the car, and came out TWO MINUTES later and they'd climbed up on the greasy lawn mower on the way to the car...yikes! heheheheh...he is a riot. you're just gonna have to hold your pee for the next 17 years. I'm still laughing that you didn't even know you HAD black paint. :) I thought things like this only happened to me. I ask my husband often - why did we want children?!?! Now my boys are teenagers. Just wait until he's a teenager. awww..sorry for your frustration. but you gotta love that picture, ha ha! I have witnessed such tantrums in the stores and send silent well wishes to the parent. that necklace is awesome. 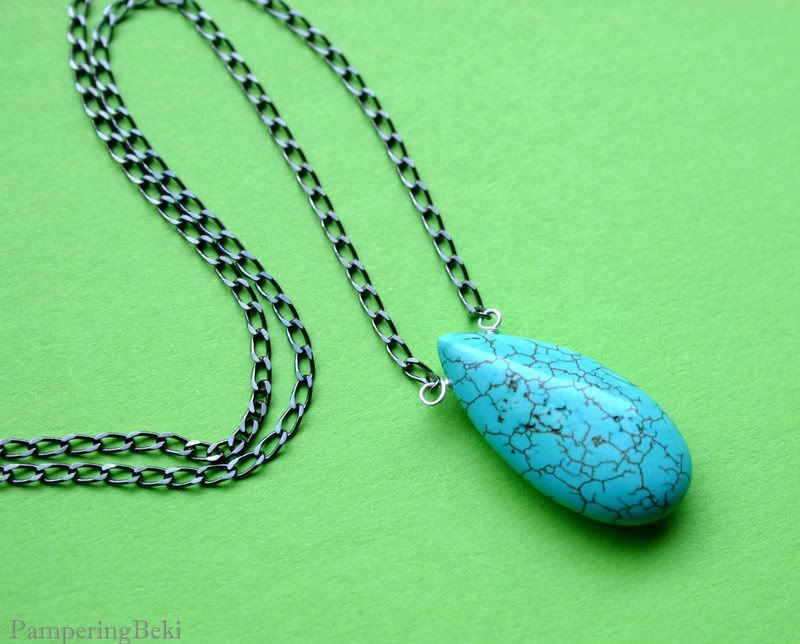 love how the texture of the chain and the design within the stone compliment each other. Sounds like him and Eleanore could totally hang out.